It was the ruling which stem cell scientists had feared. 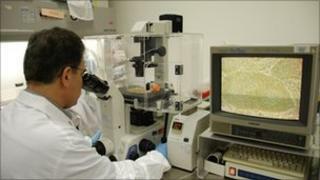 The European Court of Justice has banned - on ethical grounds - the issuing of patents for embryonic stem cell research. The ruling upholds an interim judgement I wrote about in April. The judgement is designed to prevent the commercial exploitation - via a patent - of discoveries which involve the destruction of human embryos. The ruling mentions "respect for human dignity". The test case involved a patent filed in 1997 by a German professor, Oliver Bruestle, for creating nerve cells from human embryonic stem cells. Professor Bruestle said there were many potential clinical applications, especially for patients with Parkinson' s disease. The court said "scientific research entailing the use of human embryos cannot access the protection of patent law". But the ruling said it would permit patents where the technique was useful to the human embryo itself "to correct a malformation and improve the chances of life". This is a significant ruling. The UK permits embryonic stem cell research, up to 14 days gestation. In reality, the stem cells are extracted after about five days, when the donated embryo is smaller than a pinhead. The resulting stem cells are "eternal" in the sense that they can continue growing indefinitely if kept in the right conditions. So this research does not require a production line of embryos. Nonetheless, the European Court has drawn a line and made it clear that it is unethical to profit from what it sees as the fundamentals of human life. Having read the comments from my last blog on this subject, it is clear this ruling divides opinion. Critics of embryonic stem cell research will be pleased. David Jones from the Anscombe Bioethics Centre welcomed the ruling. "It is to be hoped that this decision will act as a "nudge" encouraging scientists to turn from embryonic stem cells and towards ethical and more effective forms of stem cell research. From the perspective of those who recognise the status of the human embryo, this is a small step in the right direction." To date there have been just two human clinical trials involving embryonic stem cells - the first in Europe was announced a few weeks ago. There are, by contrast, many successful therapies using adult stem cells derived from the patient themselves. There is also promising research on so-called induced pluripotent stem cells which can be creating without destroying embryos. But stem cell researchers fear the ruling could damage this whole field of research and drive much of it abroad - to America and Asia. Patents are important if pharmaceutical companies are to recoup their investment in clinical trials and turn a profit. Professor Sir Ian Wilmut from the MRC Centre for Regenerative Medicine, University of Edinburgh, said: "It is very much to be regretted that the Court has taken this view. It will unfortunately make it less likely that companies in Europe will invest in the research to develop treatments to use embryonic stem cells for treatment of human diseases." Professor Austin Smith, Wellcome Trust Centre for Stem Cell Research, University of Cambridge, said: "This unfortunate decision by the Court leaves scientists in a ridiculous position. We are funded to do research for the public good, yet prevented from taking our discoveries to the market place where they could be developed into new medicines." Patent lawyers are likely to be extremely busy as a result of the ruling. Some are already suggesting there may be a way round the judgement, by patenting the therapeutic process rather than the stem cells themselves.